The Tall Ships 1812 Tour docked in Midland, ON last weekend and Betony and I spent a rainy Sunday afternoon walking around and checking them out. Pictured is the STV Unicorn, which I learned from their website is "the only all-female crewed tall ship in the world". How cool is that? 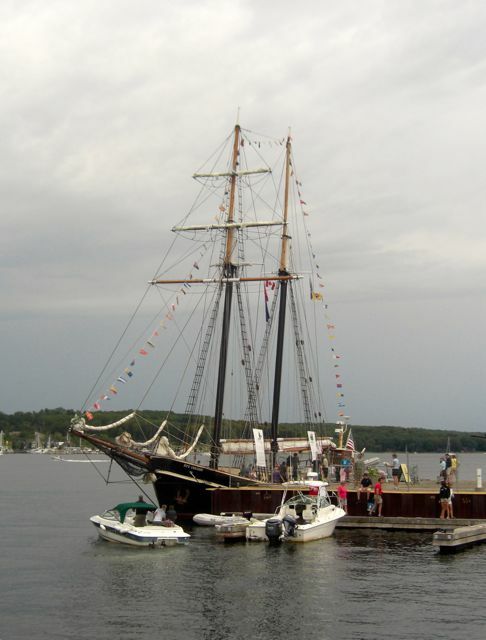 The ship is partnered with a New Jersey not-for-profit called Sisters Under Sail that is "dedicated to helping teen girls and women build confidence, develop leadership skills, and witness first-hand what women can do together when focused on a common goal." So it turns out I photographed the coolest tall ship ever.